There is no doubt that Typhoon Yolanda (Haiyan) was among the most devastating natural calamities that ever hit the Earth. Hitting a third world country, it led to thousands of deaths and total devastation of most of the structures along its path. Thousands of homes and business establishments were totally damaged. The business community took a huge hit, especially because many of the businesses were erased from the map, with nothing left but a wall or post here and there. The stocks were either swept away by the flood waters or looted in the aftermath of the typhoon. But Filipinos are known to be resilient. Little by little, the entrepreneurs rose from the devastation to rebuild their flooded empires. Surely, they encountered a lot of problems along the way yet many of them were able to succeed. In a video shared by Qualcomm Wireless Reach, we are taken back to some of the typhoon-hit areas where some entrepreneurs have succeeded in rebuilding their businesses. Of course, these businesses were not the same as they were before as everyone is still trying to rebuild their lives and may not have the means to go shopping to their hearts’ content yet it is easy to see just how much these business people have done to fulfill their dreams. For example, Alicia Dumdum had lost not just her businesses but also twenty family members during the typhoon. After the heartbreaking loss, she did not give up. She partnered with Qualcomm Wireless Reach and was able to use mobile technology through her cellphone to earn money selling prepaid load and becoming a wireless money remittance center, something that is very useful in the area. The business is a huge hit in the area where people regularly receive remittances from friends and family outside the community who had taken pity on these poor victims. 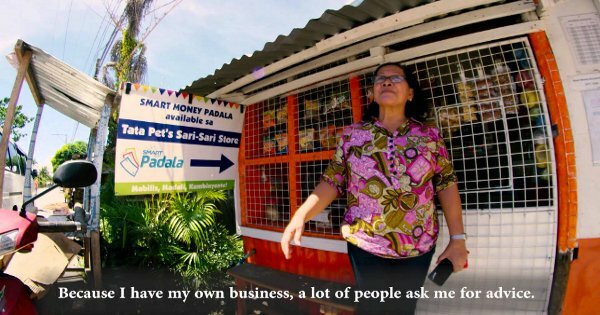 Dumdum’s business is growing and she gets to help her kababayans rebuild their own lives.